We have trademarked our alternate brand, America’s Boating Club, and developed the associated logo, tagline (“For Boaters, By Boaters”), and marketing strategy to help describe United States Power Squadrons in more appealing, easier-to-understand terms; modernize our marketing approach; and recruit new members. This is not an official name change, but a brand and trade name that presents a marketing image to the outside world. By using the word “club,” we assert ourselves as a social organization that has fun and at the same time provides great boating education and public service. 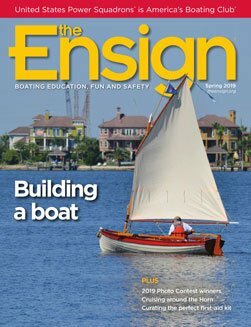 We have begun advertising in many boating publications in both print and digital formats. You may have seen these ads online or in magazines you receive at home, such as Boating World and Coastal Angler Magazine. This campaign will run through the end of the year. We are also developing a social media campaign to round out the promotional strategy. We have created a Facebook group to assist squadrons in establishing and expanding their social media presence by providing resources and guidance. If you are responsible for managing your squadron’s Facebook or social media pages, you are encouraged to join this group at bit.ly/SMforsquadrons. Many squadrons are reinvigorating their marketing approach by building on the America’s Boating Club concept. Some have already adopted a secondary marketing name by transitioning from “squadron” to “club.” How can you participate? Download and read the America’s Boating Club Marketing Guidebook at bit.ly/abcguidebook. The guidebook tells you how to incorporate the new brand into squadron marketing. It includes active links to the revised Brand Standards Manual, new logos and PowerPoint presentations that explain the new approach. The guidebook provides advice on developing a marketing program, including offering courses and activities, running a boat show booth, and publicizing your squadron’s social and educational programs. The guidebook is your squadron’s resource for improving and enhancing your outreach programs to recruit new members, attract students to your courses and seminars, and improve name recognition within your boating community. Direct any questions to me at pmermelstein@verizon.net or to Marketing Director Tammy Brown at brownt@hq.usps.org. There is a great deal of enthusiasm among members and squadrons for the new brand and marketing approach. The increased energy level is palpable. It’s a great time to be a member of America’s Boating Club. Marketing Committee Chair Paul Mermelstein has been a member of America’s Boating Club of Rockville, near Washington, D.C., for 11 years. Paul enjoys boating in the Chesapeake Bay aboard his 40-foot sailboat with his wife, Danee. Major step in the right direction!